Most schools provide a physical education program for their students. However, while these programs might take place every day or every other day in middle school and high school, in elementary school, they might only happen once a week. It may be true that elementary school provides more opportunities for physical exercise during recess but many teachers have found these short periods of time are not enough to work out all the wiggles during class. There’s also the concern in educational environments that students aren’t receiving enough exercise during the hours they spend at home due to excess use of video games, computer time, and television watching. This has led many teachers to seek for ways to bring more physical activity into their daily routines. Below you’ll find three ideas that will help you incorporate more movement and physical education into your lesson plans. Sometimes it’s a good idea to take a break during a lesson and give your class a chance to move. Introducing new math concepts, teaching science principles, or diagramming sentences, can all create a mental burn-out for your students. If you feel you’re beginning to lose their attention after a while, stop and introduce a physical activity to get their thinking caps working again. The article went on to state, “Brain-wave reading showed that after exercise, the children with A.D.H.D were better able to regulate their behavior, which helped them pay attention.” It also said that students without A.D.H.D were also shown to have improved attention after exercise. Apply this study to your classroom by allowing your students to take a break and move around. One way to do this is by utilizing your interactive whiteboard and a fun program such as the ones offered by Gynzy. 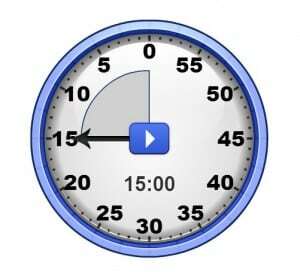 Use the Timer application and give your students a chance to get up and be active. Set the timer for anywhere between 15 to 45 seconds and tell your class they can jump, skip, or hop around next to their desks until the time is up. Another great way to incorporate some movement is to dance. 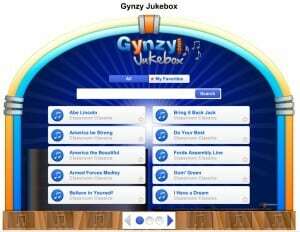 Use your interactive whiteboard and the Gynzy Jukebox tool and play some music for your kids to move to. With this tool, you can not only allow your class to benefit from some physical activity but can further stimulate their brains by playing music. With songs that range from It’s A Small World to America the Beautiful, you are certain to find something that will make your students dance! Teaching doesn’t always require students to sit in one place. Some of the best lessons and most remembered concepts come through the use of movement and activity. An October 2014 Washington Post article by Valerie Strauss, The Right—and Surprisingly Wrong—Ways to Get Kids to Sit Still in Class, talks about some of the obstacles that teachers face in incorporating exercise into their students’ lives. Since the demands of test scores and curriculum requirements take away time that could be used for exercise, you can combine the two in your classroom by making some of your lessons interactive. For example, play a spelling game with your weekly spelling list or with a word list from your literature text by using the Gynzy tool, Your Own Words Dictation. Type in your list of words then set the time interval between the display of each. Have your students stand up either at their desks or on the rug. Tell your students to spell one of the words (without showing them on the whiteboard first), and have them spell it out loud while they simultaneously participate in a physical motion. For instance, if the word is “river,” have your students jump in the air each time they say a letter. Once the class has spelled the word correctly, display the word using your interactive whiteboard then repeat the process with a new word and if desired, with a new motion as well. Another action-filled activity can be used in a social studies lesson. 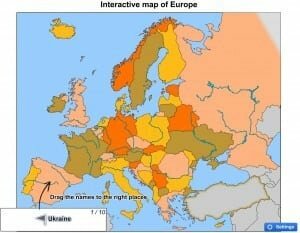 Use the Gynzy Interactive Map of Europe to teach your class about important historical events throughout the European countries. At the end of the section, set up your classroom so that certain tables represent certain European nations. Divide your class into groups and ask the first group where a certain historical event took place. Each student can run to the table that represents the nation they feel is the correct answer. Award points to the teams that get the most correct answers. Splitting the class into groups will provide an extra measure of safety and control as only a few students will be moving at a time. Activities such as the ones above not only give your students a chance to move around, they also help with the learning and retention process as the lesson is accompanied by a memorable action. Ask almost any student what their favorite part of school is and most of them will say, ‘recess.’ The chance to run, play, and interact with friends outside the confines of the classroom is something nearly every child looks forward to. Tap into the potential motivation of this favorite pastime by giving your class the opportunity to earn an extra recess or another session of physical education games. This will provide your students with increased physical activity as well as an added incentive to complete their work correctly. As part of the goal, have your class vote on an outdoor activity such as dodge ball, soccer, handball, flag football, or a relay race then set a time limit in which to achieve it. Create a goal marker that helps the class visualize their progress by using the Gynzy Chart Maker. 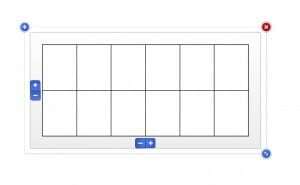 This interactive whiteboard application allows you to create your own chart by adding rows and columns. Use the drawing tool to color in the squares each time your students get closer to their goal. Giving your students the chance to earn some extra outdoor time can help them make and reach educational goals and will also provide them with additional physical activity. As already mentioned above, increased exercise has been proven to help students with their focus and attention span so you may even have the added bonus of better work following your special outdoor reward. The importance of moving has been proven in both scientific settings as well as in the everyday classroom. With physical education classes dropping to only once a week in many elementary schools, it’s even more important that opportunities be created throughout the rest of the week. These opportunities will provide students with the health benefits that come from exercise as well as with the mental benefits that come with regular movement. Since many teachers also face the challenge of dealing with special needs students in their classrooms, this study supports the use of physical education in helping moderate A.D.H.D. disorders. With so many benefits both mentally and physically, finding ways to incorporate physical education opportunities into your lesson plans will create a win-win situation for you and your students.